Japan's seasonally adjusted unemployment rate was 2.5 per cent in November. Throughout 2018, Japan's unemployment rate has remained stable at very low levels. 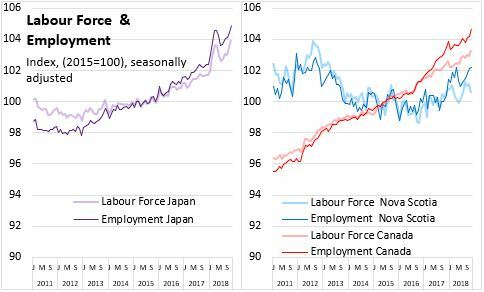 Japan's labour force and employment have exhibited greater volatility than usual during 2018, but both employment and labour force are trending up. A faster rise in employment than in labour force is reducing the Japanese unemployment rate. 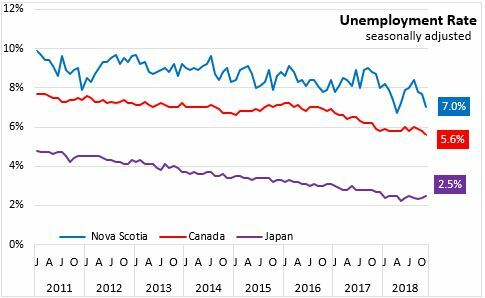 Canada's unemployment rate has also been trending down since 2016 as employment gains outpaced labour force growth. A similar pattern emerged in Nova Scotia (albeit with more volatility) in 2017.